Find a local independent agent and start protecting your finances today. 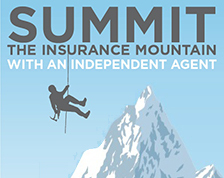 Buying insurance on your own can be like climbing a mountain without an experienced mountaineer to help you get to the top. Learn why an independent insurance agent is the ultimate guide to help you find insurance that’s the perfect fit for you.